Description Explore the supernatural mysteries of the shack called Neverland, a place where games of innocence turn to darkness. For years, the Jackson family vacationed at Rowena Wandigaux Lee's old Victorian house on Gull Island, a place of superstition and legend off the southern coast. One particular summer, young Beau follows his cousin Sumter into a hidden shack in the woods-and christens this new clubhouse "Neverland." 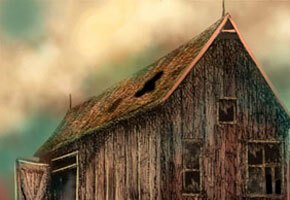 The rundown shack in the woods is the key to an age-old mystery, a place forbidden to all. But Sumter and his cousins gather in its dusty shadows to escape the tensions on Gull Island. Neverland becomes the place where the children begin to worship a creature of shadows and nightmares. Drawn from the novel by Douglas Clegg, with illustrations by Glenn Chadbourne. Controls Click on the differences with your mouse. Use the hints if you get stuck.